Writers usually avoid novellas because traditional publishers usually aren’t interested in these shorter works. A publishing house can’t make the same profit on a novella that it would with a full-length novel—which is why literary agents prefer not to handle novellas. But at Self-Publishing Relief, our experts know that the novella is absolutely perfect for self-publishing in digital format! The novella is a narrative work of prose fiction of around 30,000 to 50,000 words. Shorter than a novel but longer than a short story or novelette, novellas typically dramatize individual events or a short series of events. The conflicts in a novella have more time to develop than in short stories, with endings often poised at an important turning point in a character’s life. Typically, you have to be a celebrity author or part of an anthology to get your novella traditionally published. But with the growing number of people who prefer e-books and shorter works, there’s never been a better time than right now to self-publish a novella. Is your genre novella-friendly? A sweeping family saga, for example, or an intricate new world of science fiction may be too much for the limited word count of a novella. But most genres can be translated to novella form—romance, horror, literary fiction, even sci-fi and fantasy. Are you prepared to e-publish only? The profit margin for print novellas is limited, so it can be hard for an author to justify the production of such a slim book. But novellas are perfectly tailored for e-publishing. Would you consider an anthology? In an anthology, you share the printed space with a handful of novellas by different authors. This can be a good way to expand your readership and break into print, but your novella will probably have to fit with a common theme or topic, and you’ll have to share profits with the other authors. Will your word count be obvious? For example: The Science Fiction and Fantasy Writers of America Nebula Awards define the novella as having a word count between 17,500 and 40,000. A sci-fi fan would be disappointed, probably even angry, to realize they’ve purchased a novella rather than a 600-page novel—so be clear about your format and word count in all book descriptions. Are you writing a series? Linked novellas tend to do well in sales, and readers love them because they can read an entire book without giving up too much of their time. Readers also enjoy knowing what to read next if they’re hooked by the first book of the series. Have you already written a novel? One great use for novellas is to expand on your novel—to explore a secondary character or sub-theme more thoroughly, or to provide a prequel to what happens before the novel. A novella opens up all sorts of fun new channels, including promotional benefits for your novel, and helps increase readership. The novella is no longer the unwanted wallflower at the publishing dance. Today the novella has a strong market through self-publishing, which makes it easier than ever for indie authors to put their novellas into the hands of happy readers. 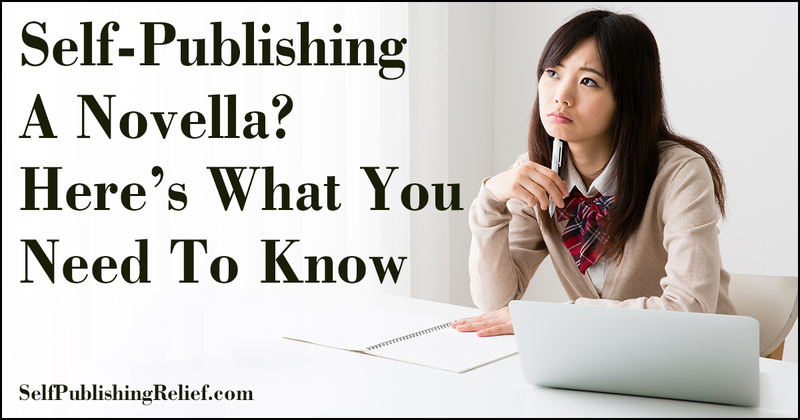 If you’d like help navigating the self-publishing process, Self-Publishing Relief can help! We’ll guide you through every step so that you have a finished book you can be proud to put your name on. Schedule a no-obligation consultation today! Question:Do you prefer writing shorter genres or novels?